The Trump Administration continues to govern with a blind eye toward inconvenient facts and analyses. Trump administration officials, under pressure from the White House to provide a rationale for reducing the number of refugees allowed into the United States next year, rejected a study by the Department of Health and Human Services that found that refugees brought in $63 billion more in government revenues over the past decade than they cost. Earlier this year, The Business Insider published data supporting the rejected administration report. A new working paper from the National Bureau of Economic Research shows refugees provide a net contribution to the economy through the taxes they pay over time, countering the notion that they are a drag on the economy due to a reliance on social benefits. The report from Notre Dame economists William Evans and Daniel Fitzgerald finds that “over their first 20 years in the United States, refugees who arrived as adults aged 18-45 contributed more in taxes than they received in relocation benefits and other public assistance.” The Notre Dame study drew on State Department data to create a sample of 20,000 refugees who entered the country between 1990 and 2014. This chart captures their findings, showing that refugees on average cross the threshold from net beneficiaries to net contributors around the 9th year after migration. The research also found that refugees who arrived before the age of 14 had, by ages 19-24, graduated from high school at the same rates as American youth. By ages 23-28, those refugees displayed the same college graduation rates as the US-born population. “Refugees who arrived as children of any age have much higher school enrollment rates than U.S.-born respondents of the same age,” the research finds. 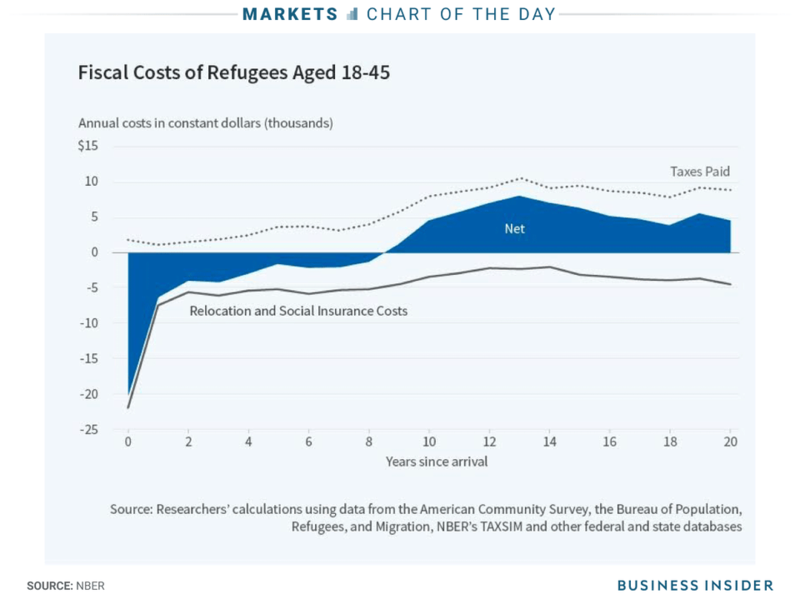 The US spends an average of $15,148 in relocation costs and $92,217 in social benefits over an adult refugee’s first 20 years here, the NBER said, citing the Notre Dame report. Over that period, the average adult refugee pays $128,689 in taxes — $21,324 more than the benefits received. This entry was posted in DACA, immigration/deportation, Trump and tagged refugees, Stephen Miller, taxes. Bookmark the permalink.